1.In large bowl, cover woodchips with warm water; soak as label directs. 2.Remove and discard giblets and liver from chickens. To remove backbone from each chicken, place chicken breast side down on cutting board with neck cavity toward you. With strong kitchen scissors, cut along both sides of the backbone all the way through to the sides of the tail; discard backbones. Flip chickens over; gently press down on all areas of chickens to flatten. Pat chickens dry with paper towel; evenly sprinkle chickens with seasoning. Let stand 30 minutes. 3.Prepare outdoor grill for indirect grilling over medium heat. Drain woodchips; place 2 cups in aluminum foil pan. Place foil pan on hot grill rack over lit side of grill; close grill. 4.When woodchips begin to smoke, place chickens breast side up on hot grill rack over unlit part of grill; cover and cook 30 minutes, adding woodchips as necessary to maintain smoke. Brush half the oil over chickens; flip chickens and brush with remaining oil. Cover and cook 10 minutes or until skin is crispy, juices run clear and internal temperature in thickest part of thighs reaches 160°F. 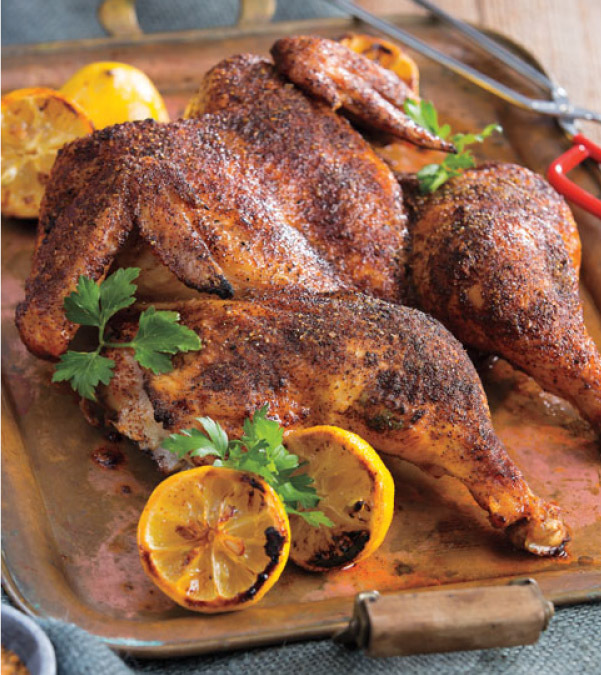 If skin begins to burn, flip chickens and continue cooking to 160°F. 5.Transfer chickens to cutting board; loosely cover with aluminum foil and let stand 10 minutes before carving. 6.Place lemons cut side down on hot grill rack over lit part of grill; cook, uncovered, 8 minutes or until grill marks appear. Serve with chicken.